Photographed in Bismarck, North Dakota this week. Minneapolis was the third city in the United States to pass a resolution of support for Standing Rock Sioux Nation and its fight against the Dakota Access Pipeline. Now, the Hennepin County Sheriff has sent Special Operations units, which Lakotas say are part of the militarized police assault which is terrorizing women, children and elderly. The Hennepin County Sheriff claims they are responding to an emergency. Standing Rock water protectors say the only emergency is their human rights and civil rights are being violated by a violent, out-of-control, militarized police gang. Native Americans and allies are under attack by a militarized police operation -- with public funds and services co-opted by a private pipeline -- which violates their human rights, and civil rights, with every violent attack by police. In recent weeks, Morton County Sheriff's deputies, National Guard, Highway Patrol and DAPL private security have engaged in a reign of terror -- with increasing violence. 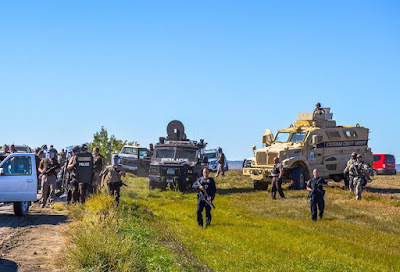 Water protectors in prayer have been pepper-sprayed repeatedly in the eyes, grabbed by the neck and thrown to the ground, beaten with batons, and terrorized with loaded assault weapons and shotguns pointed at them, while surrounded by armored vehicles. They have been bitten by vicious dogs. Morton County has strip-searched women and men and then jailed them without credible charges, victimizing them with false imprisonment. Further, one Lakota woman was strip-searched and left naked in a jail cell all night, with no credible charge. She is the daughter of LaDonna Brave Bull Allard who owns the land where Camp of the Sacred Stones is located. Minneapolis was the third city to pass a resolution in support of the Standing Rock Sioux Nation's fight to halt the Dakota Access Pipeline. The Cities of Seattle and St. Paul previously passed resolutions in support of halting the pipeline that threatens the water source, the Missouri River, of the Dakota, Lakota and Nakota peoples. Members of the Minneapolis City Council and St. Paul City Council delivered the resolutions on Sept. 5, 2016. Minneapolis said in its resolution, "The Dakota Access pipeline – a project also financially supported by the Enbridge company – has received weeks of resistance from the Oceti Sakowin, or the Seven Council Fires comprised of the Lakota, Dakota, and Nakota Nations." 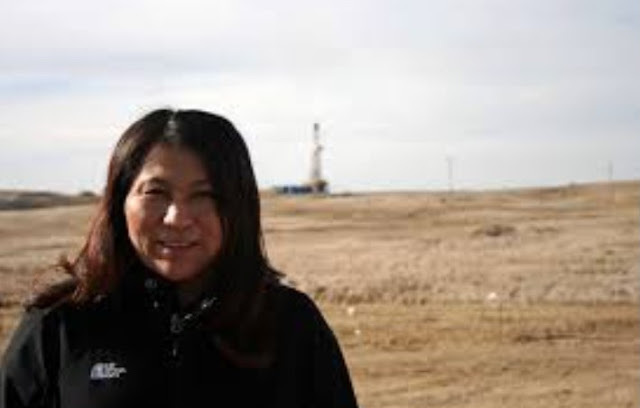 "The Oceti Sakowin established the Sacred Stone Spirit Camp in Cannon Ball, North Dakota to halt the project due to its lack of environmental review and consultation with Tribal leaders." "If built, this line would carry as many as 570,000 barrels of fracked crude oil per day for more than 1,100 miles from the Bakken oil fields of North Dakota to Illinois," Minneapolis said. 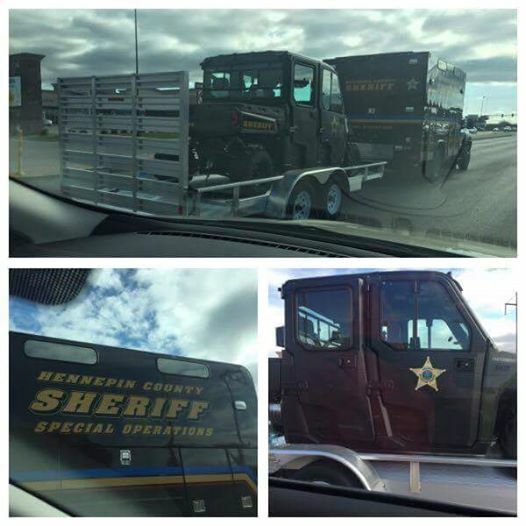 Now, the huge militarized vehicles of Hennepin County, where Minneapolis is the county seat, have arrived to terrorize Standing Rock. “At the request of the Governor of the State of North Dakota, and as approved by the State of Minnesota, on Sunday, Minnesota Sheriff’s Deputies from the Hennepin, Anoka, and Washington Counties’ Sheriff’s Offices were deployed to assist in Morton County, North Dakota. These deputies are part of a larger contingent of hundreds of law enforcement officers from around the Country who have responded to the request made through the Emergency Management Assistance Compact, (“EMAC”), a nationally adopted system for sharing personnel and resources via state-to-state aid agreements. Soldiers, Weapons, Vehicles, Special Forces... to help out Energy Transfer pipeline private Company that is not providing a public utility to North Dakota. Economic oppression, Military/police oppression, Justice system oppression, in the face of Injustice the Water Protectors keep praying and have maintained peace. Energy Transfer company must really be afraid of prayers if they are hiring mercenaries! I bet those same execs go to church on Sunday & put their dirty $ in the offering. What will they do for their children when they are ill? Are they buying all of their water? Its like these seemingly 'nice' people are members of a 'death' culture who are willing to destroy in order to get $$ and live the 'rich' life. Water is Life! Health over wealth!